We offer an extensive range of beautifully designed personalised branded parasols to suit all budgets and requirements. 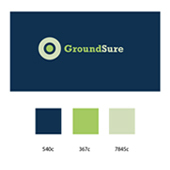 We pride ourselves on quality, if your brand is on such a visible product like a parasol, you want it to last, perform and impress. We offer complete range of unparalleled quality promotional parasols culminating in our premium Über Brolly range which comes with a FULL PERFORMANCE GUARANTEE. We are the only company in the UK to offer such assurance, a promise from us to you of exceptional quality. 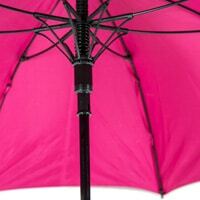 Brollies & Parasols, unlike many of our competitors, are parasol specialists. We don't sell awnings or blinds, we leave this to the awnings and blinds specialists! As we only deal with parasols, we have very specialist in-house skills, with huge experience in all type of parasols so we can offer you in-depth advice and guidance, ensuring that you end up with the exact matched branded parasol for your requirements. Finally here at Brollies & Parasols we supply promotional umbrellas and parasols to a wide and diverse range of high end clients across the UK. The majority of our customers place orders with us on a regular basis and we developed a very close relationship with over the years. This is a true testament not only to the exceptional quality of the promotional umbrellas and parasols that we supply and brand, but also to the customer service and support that we offer. 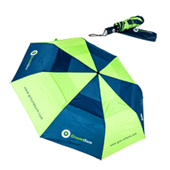 Send us your logo, pantone references and any rough design ideas for your umbrella or parasol. Our design team will produce a range of free customisabe CAD designs for you to choose from. 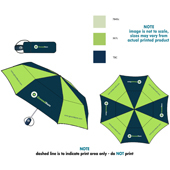 A fully printed sample of your umbrellas or parasols will be sent to you directly for approval. We will dispatch your umbrellas or parasols to any worldwide address, fast and safely. If you are looking for something to truly show off your brand and exude quality then our premium Über Brolly range of promotional umbrellas and branded parasols is the best place to start. Where you see the Über Brolly stamp you are promised innovative design, cutting-edge technology and superior materials. Within the Über Brolly range we offer a wide range of branded umbrellas and promotional parasols that all come with FULL PERFORMANCE GUARANTEES so you can completely trust your promotional umbrella to perform, last and carry your brand with longevity. 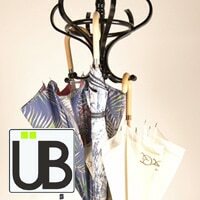 Über Brolly, our premium collection, offers you the strongest promotional umbrellas and branded parasols on the market. Our storm-proof products are ideal for the temperamental climes of the UK where rain and wind come hand in hand. With super strong fibre-glass ribs and other features include extendible ribs and independent vented canopies, you can be reassured that your branded umbrella is robust, sturdy and will stand the test of time. Opt for peace of mind and our full performance guarantee promise with our Über Brolly collection.